President Andrew Johnson, (father-in-law of David Trotter Patterson), a Representative and a Senator from Tennessee and a Vice President and 17th President of the United States; born in Raleigh, N.C., on December 29, 1808; self-educated; at the age of 13 was apprenticed to a tailor; moved to Tennessee in 1826; employed as a tailor; alderman of Greeneville, Tennessee, 1828-1830; mayor of Greeneville 1834-1838; member, State house of representatives 1835-1837, 1839-1841; elected to the State senate in 1841; elected as a Democrat to the Twenty-eighth and to the four succeeding Congresses (March 4, 1843-March 3, 1853); chairman, Committee on Public Expenditures (Thirty-first and Thirty-second Congresses); did not seek renomination, having become a gubernatorial candidate; Governor of Tennessee 1853-1857; elected as a Democrat to the United States Senate and served from October 8, 1857, to March 4, 1862, when he resigned; chairman, Committee to Audit and Control the Contingent Expenses (Thirty-sixth Congress), Committee on the District of Columbia (Thirty-sixth Congress); appointed by President Abraham Lincoln Military Governor of Tennessee in 1862; elected Vice President of the United States on the Republican ticket with Abraham Lincoln in 1864 and was inaugurated on March 4, 1865; became President of the United States on April 15, 1865, upon the death of Abraham Lincoln; wide differences arising between the President and the Congress, a resolution for his impeachment passed the House of Representatives on February 24, 1868; eleven articles were set out in the resolution and the trial before the Senate lasted three months, at the conclusion of which he was acquitted (May 26, 1868) by a vote of thirty-five for conviction to nineteen for acquittal, the necessary two-thirds vote for impeachment not having been obtained; retired to his home in Tennessee upon the expiration of the presidential term, March 3, 1869; unsuccessful candidate for election to the United States Senate in 1869 and to the House of Representatives in 1872; elected as a Democrat to the United States Senate and served from March 4, 1875, until his death near Elizabethton, Carter County, Tenn., July 31, 1875; interment in the Andrew Johnson National Cemetery, Greeneville, Greene County, Tenn.
Family tradition holds that Andrew Johnson arrived in Greeneville with a cart drawn by a blind pony in 1826. His mother and step-father were with him. Tradition also says they camped at a spring on the Homestead property. Andrew Johnson's father died when Andrew was three years old. Soon his mother apprenticed Andrew and his brother William to a tailor. The boys later ran away from their apprenticeship and had a $10.00 reward posted for their return. Andrew Johnson was a man with whom nearly every American can relate, from the poorest to the wealthiest. With unyielding determination, he rose from dire circumstances to the nation's most prestigious office without having attended a single day of school. Alaska was purchased from Russia for $7,200,000.00 during Andrew Johnson's administration. Secretary of State William Seward was instrumental in the purchase. People who thought the investment a bad idea called the purchase "Seward's Folly." Andrew Johnson's final resting place is on a high hill known as Monument Hill. President Johnson was buried with the American flag wrapped around him and with his head resting on the Constitution of the United States. Andrew Johnson held the first Easter Egg Roll on the White House Lawn; it had originally been held at the Capitol building. According to William Johnson, a former slave belonging to Andrew Johnson, William's mother Dolly asked Andrew Johnson to purchase her because she thought he looked kind. Johnson bought not only Dolly, but her brother Sam as well. Andrew Johnson had the rudiments of an education prior to his marriage to Eliza McCardle. She helped further his education by tutoring him from her schoolbooks and reading to him in the Tailor Shop while he worked. Andrew Johnson was impeached, but not removed from office. He was the first president to be impeached by the House of Representatives and tried by the Senate. Many Republican Senators put their political careers on the line by voting to acquit. Andrew Johnson was a Democrat; Abraham Lincoln was a Republican. The National Union Party existed as a structured, nationwide party for the first time in 1864, for the ticket of Lincoln and Johnson. It was an attempt to unify Republicans and pro-war Democrats. Martha Johnson Patterson, Andrew Johnson's daughter, said their slave Sam would boast that he was Johnson's servant. "But in truth," she continued, "Andrew Johnson belonged to Sam." According to family tradition, Andrew Johnson told Sam where he wished to be buried. Queen Emma of the Sandwich Islands (now known as the Hawaiian Islands) came to visit President Andrew Johnson in Washington. It was the first time a Queen had visited the White House. She gave this ivory basket to President and Mrs. Johnson. It is now on display in the Andrew Johnson NHS museum. Andrew Johnson was injured in a train wreck in 1857. Afterwards his right elbow was virtually immobile and he often used a signature stamp for documents. Mordecai Lincoln, a relative of Abraham Lincoln's, performed the marriage ceremony for Andrew Johnson and Eliza McCardle. A successful transatlantic cable was completed in 1866. This connected America and England by telegraph and helped tremendously with international communications. The original cable, completed in 1858, worked only three weeks. The Civil War and financial troubles interrupted the effort until 1865. Andrew Johnson died in 1875 after becoming the only president to return to the Senate. He was buried in Greeneville, TN, with the Constitution resting under his head and with his body wrapped in the American flag. The Andrew Johnson National Historic Site honors the life of the 17th President: Andrew Johnson's presidency, 1865-1869; illustrates the United States Constitution at work following President Lincoln's assassination and during attempts to reunify a nation torn by civil war; how his presidency shaped the future of the United States; and his influences which continue today. 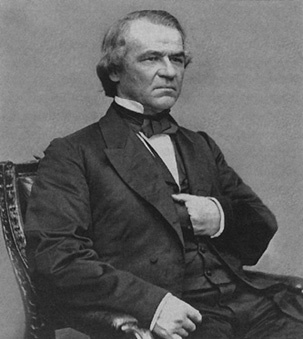 Andrew Johnson granted four Amnesty Proclamations to the South following the Civil War. Anyone excluded in the first amnesty plans could appeal directly to the President for a pardon. On Christmas day, 1868, Andrew Johnson granted full amnesty to the former Confederates, including Confederate President Jefferson Davis. During Andrew Johnson's administration, the United States purchased Alaska, annexed Midway Island, and communicated with Europe following the completion of a successful Transatlantic Cable. The British Novelist Charles Dickens and Queen Emma of the Sandwich Islands both paid visits to the White House. Andrew Johnson was also the first President to hold the Easter Egg Roll at the White House, and when he turned 60, he invited 300 children to the White House for his birthday party. Andrew Johnson and Congress were unable to agree on a plan for restoring the ravaged country following the Civil War. There was a marked difference between Congressional Reconstruction - outlined in the first, second, and third Military Reconstruction Acts - and Andrew Johnson's plan for Presidential Restoration. The Congressional Plan of Reconstruction was ultimately adopted, and it did not end until 1877. Many of the issues surrounding Reconstruction are still a part of society today. Andrew Johnson was a man of many seeming contradictions. He was a Southerner, and yet he firmly believed in the Union. He believed in the Union, yet he believed that many political decisions should be left to the individual states. He was a slave owner who was a product of his time, but he was also a man called a "Moses" for the freedom of slaves in Tennessee. On January 1, 1863, Abraham Lincoln's Emancipation Proclamation freed slaves in states still in rebellion against the United States. Tennessee, although a seceded state, did not fall under the provisions of the proclamation. Tennessee was under Union control, and Andrew Johnson was serving as Military Governor. According to tradition, Andrew Johnson freed his personal slaves on August 8, 1863. On October 24, 1864, Andrew Johnson freed all the slaves in the state of Tennessee. The remaining tickets were distributed to the Senators. Review: This documentary on the life of Abraham Lincoln is an excellent exploration of the character and inner life of our 16th president. At the same time it provides the viewer with much valuable information about the character of his wife, Mary Todd Lincoln, their marriage, the tragic deaths of two of their children, and how Lincoln continued to love his wife until his death, even though she was in many ways a liability for him. While the Lincolns as individuals are the focus of the series, the viewer is not shortchanged in regard to the presidency or the Civil War.Lincoln's growth during his four years in office is examined critically and fairly by various historians. The story of the Lincolns was originally shown on PBS's program "American Experience," and follows the format that has made that series so respected by viewers. Photographs, drawings, paintings, maps, and other artifacts contemporary to the times alternate with new film footage that enhances the story line. Well known performers do the voiceovers -- in this case David Morse is Lincoln, and Holly Hunter is the voice of Mary Todd Lincoln. There are no stagey recreations of events with unknown performers taking the parts of historical characters, which one often sees in series made for The History Channel or Arts and Entertainment Network. The three volume set runs about six hours and contains bonus materials that appear on each individual disc. The quality of the picture and sound is outstanding. The music is excellent and of the time period, and is never distracting. While people of all ages and backgrounds in American history could enjoy this series, I especially recommend it to families with high school or college age students, along with Ken Burns "The Civil War" and the PBS video biography of General Grant. This would also make an excellent gift for Father's Day or for a Civil War buff's birthday. Bibliography: American National Biography; Dictionary of American Biography; Trefousse, Hans L. Andrew Johnson: A Biography. New York: W.W. Norton & Co., 1989; Johnson, Andrew. The Papers of Andrew Johnson. Edited by LeRoy P. Graf, Ralph W. Haskins, and Paul H. Bergeron. 11 vols. to date. Knoxville: University of Tennessee Press, 1967; Andrew Johnson National Cemetery; Andrew Johnson National Historic Site; National Park Service.